Once a problem is identified – and I mean the real problem, not the symptoms – identifying the relevant solution usually is fairly straightforward. Unfortunately, when it comes to running the business part of their practice and managing client expectations (rather than solving legal questions), at best many lawyers unwittingly fall somewhere in the middle of the spectrum between addressing the symptoms and addressing the underlying problem. This is readily seen in the context of lawyers’ responses to the ever increasing RFPs from clients. Many lawyers and firms view preparing RFP responses as something their administrative or management team should address with little or no lawyer involvement. While I am quite confident that many talented professionals fill these administrative and managerial roles, most times these professionals do not have relationships with the client and need the lawyer(s) actively involved in the response process to provide the context needed to identify the real problem triggering the RFP. In hope of helping those administrative and managerial professionals who struggle to get their lawyers interested and actively engaged in reviewing and responding to RFPs (or any client relationship efforts for that matter) and those lawyers who mindlessly respond to RFPs, I am sharing some examples of what this spectrum looks like and the impact on results. The worst symptom-approach example I know of concerns a firm that assumed that a long-standing client’s RFP was a formality that need not be taken seriously – after all, the firm was the clear incumbent. The firm invested little deep thought in preparing its response; in the end, the firm’s submission missed the mark and lost the very large (as in lots of zeros) repeating client business to another firm. I heard about this one after the fact. Conversely, the best real-problem-approach example I have witnessed was a firm that took an unexpected RFP from a key client (regarding services the firm had been providing for the past ten years) seriously, despite being undisputed experts in their area of practice and the client’s go-to provider. The result? The firm earned a spot on the client’s final list of approved vendors moving forward. That two other firms were added to that list confirmed that the RFP process was real, with no guaranteed outcome. Full disclosure – I know because I helped the incumbent firm prepare its RFP response. My guess is many firms (including the unsuccessful firm in the first example) stop asking themselves any more questions as long as everything looks pretty straightforward and they have many precedents to pull from in answering the RFP’s questions. From what I have heard and seen, many of these automatic RFP responses do not end well for incumbent firms. demonstrate that the public’s money is being spent prudently. Keeping this context in mind, the firm answered each of the many RFP questions in a way that demonstrated their understanding and responsiveness to the organization’s needs and sensitivities, expertise in the field and how that expertise specifically benefitted the client in the past and would continue to do so in the future, and overall cost-effectiveness. While not expressly asked, the firm also identified the main types of work that the client relies on the firm for, areas where retainer and fixed fees may be appropriate (providing cash flow certainty for the firm and cost certainty for the client), and alternative fee approaches for more specialized work (again to provide the client with more budgeting certainty). Notably, while the firm was not able to ask their client for background, self-posed questions needed to identify the client’s underlying problem helped the firm piece together the most likely reasons behind the RFP. The firm could answer its own questions based on general information from the firm’s existing relationship and public knowledge to craft a relevant, meaningful, and competitive response. Even with imperfect information, trying to understand why a client has put out an RFP (or included questions on topics like budgeting and project management capabilities) goes a long way to helping you identify and address your client’s real, underlying issue. And that is what client service is all about. So if you are not already, I strongly encourage you to ask these sorts of questions and have these internal discussions. Your clients (and your bottom line) will thank you for it. Lawyers: Jump Out of the Pot! Fact: the legal profession is operating in a mature market undergoing significant change. Fact: many lawyers think the change doesn’t apply to them (after all, while their colleagues and peers might not, they have great client relationships and provide unique services) or that clients don’t understand what is involved and are just seeking to pay less for something worth far more. I wish these lawyers could see what I regularly see and hear what I regularly hear. Clients, under ever increasing pressure to provide integrated, practical legal input while reducing costs, express frustration due to the lack of data, innovation and partnership offered by their lawyers. The result is that many relationships either limp along on life support or are suddenly terminated after years of a lawyer being the go-to provider. I know from working with consumers of legal services that while they are indeed often seeking to pay less in the aggregate for legal services, they are also often willing to maintain or even increase spend on certain must-have elements of services and are quite pleased to see changes in the nature and type of services received (from scope to product to process). 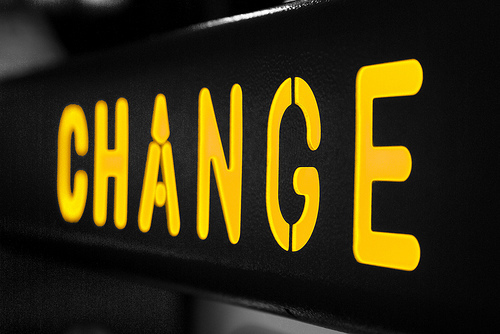 As a result, change doesn’t need to be a zero sum game for providers. figure out how to help their clients address the same issue (not necessarily with the same product) for less. I also know from working with firms that many are frustrated by the lack of attention, input and appreciation they receive from their clients. Examples abound of firms receiving detailed RFP requests with no ability to ask questions or receive context regarding the underlying business objectives. In many instances, firms work hard to suggest complex alternative fee arrangement options, only to have clients select something from off the menu – a fixed reduction in hourly rates. More often than not these situations arise when clients don’t have the data or time required to provide the necessary context or assess whether the suggested alternative fee arrangements are reasonable. While clients do bear some responsibility for addressing the current state of affairs, at the end of the day the lawyers are the service providers and the onus is on them to come up with viable solutions. Even with cooperative clients, no silver bullet will completely address a rapidly, ever-evolving operating reality. Given the complexity of forces and interests at play, I have yet to see a firm-client relationship that is above improvement or lends itself to a quick fix. You would think these attributes would make finding a solution right up most lawyers’ alleys. After all, what lawyer doesn’t love a nice juicy problem to solve? Puzzling then that many avoid this problem like the plague. While many reasons for this aversion exist, two particular qualities hinder many lawyers’ ability to successfully take the action needed to thrive in the long term. The first is the pursuit of perfection. Not only does a quest for the perfect legal answer fly in the face of what most clients seek, but it can also kill relationships. I have seen lawyers steadfastly cling to their historical approach of producing their ideal legal product only to lose their book of business to lawyers willing to innovate and take new approaches to clients’ needs. The journey to innovative approaches is rife with missteps, dead ends, mistakes and imperfections. Recognizing that no one right answer is out there in this time of change, and that trial and error are part of the iterative development and change process, is required for lawyers to adapt and adopt an approach that works for everyone. The second is the perception that lawyers need not be hasty in figuring out how to proceed – after all, plenty of time remains before they will (if ever) face a burning bridge. So, many observe from afar the myriad of existing technologies that can help lawyers adapt to the new market. They consider and often reject Legal Project Management (LPM) principles, processes, tools and techniques that support identifying and making the change necessary to adapt to the new market realities. They are apparently waiting for technology that is simple, intuitive, inexpensive and helpful enough to make adoption a no-brainer. They are waiting for a simple template that can be presented in a one hour LPM workshop, adopted the instant they leave the session, and allow them to address all their clients’ needs without changing their approach to practice. They wait until everyone else has accepted and adopted a new approach. 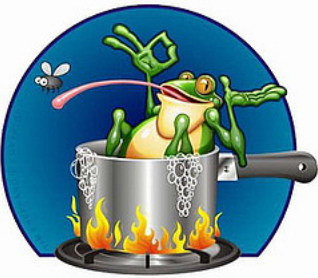 As they wait, they fail to realize that they are the frog in the pot of boiling water. Sadly, it may well only be at full-boil when those lawyers realize the water is too hot because the bridge is burning. Some level of data gathering, analysis, strategic thinking, decision making, hard work, risk-taking and failures are inevitable for lawyers to make the adjustments necessary to successfully continue to delight their clients, while living a life that doesn’t involve routinely toiling behind their desks until the wee hours of the morning for a sliver of an ever shrinking pie. My money is on the lawyers, firms and organizations that are taking the temperature of the water and figuring out how to use technologies, LPM principles, tools and techniques to help them insulate themselves and – ultimately – jump out of the pot. Change is a tricky thing for most. It seems to be particularly difficult for those in the legal industry. My theory is that the profession is so steeped in precedent and tradition (always looking back) that lawyers need to fundamentally rewire to look forward and figure out how to thrive in a new environment where the days of “hours worked equals pay received” are quickly fading. In an effort to address clients’ rapidly growing demands for certainty and value, there is currently a flurry of activity as lawyers in both firms and organizations rush to adopt project management principles. But, what is project management for lawyers really? At its most basic, legal project management involves understanding what the client needs, looking at the process of how lawyers create and deliver what is needed, and then identifying ways to improve the process to better support providing certainty and value. Certainty should be relatively easy to establish, at least regarding time and cost, once the need and desired scope/product has been determined. Surprisingly, most firms and organizations have the relevant time and cost information squirreled away in various nooks and crannies, but not centralized or in a readily accessible data format. This makes it tricky to determine time and cost parameters for their legal products or needs. Gathering this data, even on the most general level, is in and of itself a valuable exercise for lawyers in firms and organizations alike. The tools, principles and technology available to support gathering the data are numerous and varied, from the basic to the highly complex. At the end of the day, though, some work is required on the part of the lawyers to group their product types and, ideally, provide a general outline of their process. Interestingly, whether they realize it or not, all lawyers have some sort of processes to get from the initial client question to their final legal product. Some of these processes are more efficient than others. Sadly many lawyers are unintentionally inefficient as the billable hour neither promotes nor encourages efficiency (such that many have never thought about their practice from an efficiency perspective). Unlike certainty, value is more subjective. So, madly creating processes and introducing technologies to establish certainty without understanding and identifying what value means to your clients and what your strategy for achieving certainty is, likely will not be the best use of your resources. For example, determining whether your clients value low-cost certainty, outcome certainty, or fixed-cost certainty and whether the answer is product-dependent will directly affect the approach you take to planning, process mapping and implementing appropriate change, as well as developing and introducing associated technologies in your firm or organization. For firms in particular, making the effort to adjust to really serve your client’s needs often means being willing to take a short term hit in the pocket book (this does not mean the hit will actually materialize; but, you do need to acknowledge and be prepared for the possibility) as you identify and implement meaningful change that will delight your clients in the medium and long term. Surprising as it may sound to those in firm settings, clients want the lawyers they work with to be around for the long term as switching lawyers generally is a pain. most successful lawyers have highly portable books of business (surprisingly few clients were adversely affected by recent firm failures). Yet the change involved with retooling to deliver certainty and value generally takes a number of years to master. In this context, it is no wonder the needed change is so slow and difficult in firm settings. I do not envy managing partners’ roles during these interesting times. That being said, change is inevitable and client demand is growing exponentially. So lawyers, if you are in a firm setting, support your managing partners and your firms and get thinking about what you personally can do about your process for delivering advice to your clients and what specifically your clients value. Do not be fooled into thinking you can rely on past success – financial pressures are everywhere and jumping ship during these interesting times only delays the inevitable. If you are a lawyer working in an organization, think not about the immediate budget pressures but about what your organization truly needs and values so that you can work productively with your firms to get legal services that support both you and your organization’s success. Working together to address the new realities, firms and organizations have everything to gain. The 2013 KM White Paper “Knowledge Management: Intelligent Business At Its Best” has been released! Organized by Mary Panetta of ILTA’s KM Peer Group Steering Committee, this annual publication has an in-depth look at a wide variety of traditional and cutting-edge knowledge management topics. I was particularly impressed by the scope of topics in this issue. The articles collectively demonstrate KM’s centrality in addressing new legal business issues such as pricing, legal project management, and big data, as well as the vitality of new approaches to traditional knowledge management concerns such as precedents management, document automation, and portals. In “KM Professionals: A Natural Fit for LPM,” Lisa Gianakos of Pillsbury Winthrop Shaw & Pitman LLP, shares the results of some surveys of Legal Project Management initiatives and knowledge management professional in (mostly large) law firms. She found that the majority of the firms who responded to the survey (75%) had either formal or informal LPM programs, about the same amount as had KM programs. Where respondents had LPM and KM programs, KM was involved in LPM 59% of the time. Along with other analysis of LPM in law firms, she also shares many (anonymized) comments about how LPM programs got started and how KM interfaces with, supports, and sometimes manages LPM programs. 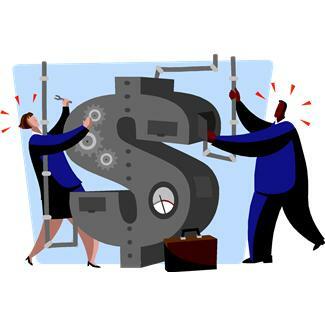 In “The Pricing Professional’s KM Toolkit,” Chris Emerson and Amy Wu of Bryan Cave LLP argue that professionals who are responsible for pricing and budgeting must understand a firm’s KM assets in order to excel at their work. (I have been making the same argument from the other side, that KM professionals have a tremendous amount to contribute to pricing and budgeting efforts.) The authors cover key KM resources, most notably matter experience databases, and how they can be leveraged specifically for pricing work. They also reveal another impressive Bryan Cave innovation, custom software which essentially uses a trainable probability-based software engine to greatly speed up the time required to analyze historical time entries and how they might fit into a phase-task coding framework, in similar fashion to predictive-coding eDiscovery software. In “Big Data, Predictive Analytics and Social Consumerization: Big Hype or Big Opportunity,” KM Distinguished Peer Eric Hunter of Bradford & Barthel and Spherical Models argues that the legal industry needs to take a lesson from the social consumer companies’ use of predictive data analytics. He sees opportunities for improvements in data management, staffing, pricing, and client service. For instance, his firm uses data analytics to assess attorney performance for specific personal injury defense clients, taking into account factors such as the level of injury, doctor involved, and the like. They hope to move towards outcome prediction, both in terms of settlement payouts and litigation costs. In “Another Look at Precedent Management“, Boston-area colleague Marybeth Corbett looks at precedent systems and Wilmer Hale’s efforts to incorporate some cutting-edge document drafting and assembly tools into its practice. I agree with you Marybeth that effective precedent systems are nothing to be ashamed of these days! She includes a useful set of key questions to ask about a precedent management blueprint. In “Document Factories: Building Document Automation Tools,” Anthony Kikuta of Wilson Sonsini Goodrich & Rosati LLP lays out criteria for selecting document assembly or automation in great detail. He addresses the range of features available in packages such as Contract Express, and spells out how to get the most out of your document assembly tools. In “KM Standards In Practice,” KM PG Steering Committee member Andrew Baker and Dustin Robinson, of Seyfarth Shaw LLP, relay their experience with the document analytics tool “KM Standards,” summarizing it as a powerful but imperfect tool, the “Swiss Army Knife With A Slippery Handle” of precedent work. (Another firm’s experience with this technology was recently addressed in an ILTA webinar covered here.) They see a very broad range of potential uses, but have focused on three; creating clause/precedent collections, client-specific content management, and benchmarking. They share valuable lessons about how to work with this tool to increase client value. In “Using Design To Improve KM,” KM practitioners Andrea Alliston and April Brousseau of Stikeman Elliott and Tangledom consultant (and known design expert) Kate Simpson tell about out a “lawyer-centric design process” that in their “CLE Manager” case study significantly improved software development. They argue that the goal of the design process should be to convey to the IT designers a rich understanding of end user needs and tasks so that “at last we [speak] the same language.” KM practitioners are uniquely situated to be able to convey that understanding. Helpful charts contrast traditional software development with a design-centric approach. In “Experience Matters at Dechert,” Kelly Breslin and Julie Ketover cover their firm’s development and incipient rollout of “DechertEXP,” an experience management system. They’ve effectively laid out the importance of tying together the many sources of information, collected at different points in the matter life-cycle, for complete experience coverage. A sidebar with “Top 10 Takeaways” has some succinct and doubtless hard-earned lessons. Lastly, in “Creating an International Client-Facing Knowledge Website,” Jellienke Stamhuis of Ius Laboris and Richard Lister of Lewis Silkin LLP in England cover their successful efforts to launch Ius Laboris’ international client-facing KM portal addressing human resources (HR) issues. I was especially impressed with how far they advanced from where they started and by the personalization feature whereby counsel can select an HR issue and choose several countries, and receive a comparison of the laws on that issue in those countries. In preparation for the panel I spoke on in late October at the Ark Conference (ably live-blogged by Mary Abraham), moderator Joshua Fireman developed but did not get a chance to ask me a question that I have been wrestling with for several years now. Legal KM doesn’t have to own pricing in order to add tremendous value to the pricing and fee arrangement (“AFA”) work at your firm. Legal KM can be a valued counselor, consultant, and partner with the people doing pricing and budgeting work. The exact role does not matter, but the extent of your contribution does matter, to the perception of KM as a strategically focused department in your organization and possibly to your own career. It’s important for the profession that step up, not just because it will be good for us personally and collectively, but also because such efforts are or should be a priority for the industry, and there is great demand for assistance in this area at law firms (and law departments for that matter). The legal KM community can bring to bear our skills in managing information, including matter information; our database and search, and taxonomy skills; our ability to comfortably talk to lawyers about the business and practice of law; change management skills; and also a substantive understanding of the underlying work. We can put these skills to good use within the firm by focusing them on information and processes that are really important for budgeting. I believe that this is an area of significant and perhaps even crucial opportunity for legal knowledge management. Budget database development, structure, and integration with existing firm systems (such as portals). Budget collection (KM professionals are quite familiar with attempts to get lawyers to contribute to a centralized firm database, and also in many cases understand more automated or established processes for such collection). Collecting, organizing, presenting, and sharing matter information related to budgeting, such as deal size & complexity, opposing counsel, forum, and disposition. As I mentioned at the conference, your firm may already be collecting matter experience information for marketing or substantive KM purposes that is potentially or actually already useful for pricing analysis. At my firm we have had a KM program that has spent significant effort over the last five years (at least) collecting, organizing, and developing systems to leverage firm matter experience, some of which (such as litigation disposition information) has already proved its worth when leveraged for pricing and budgeting needs. Identify which information is critical to budgeting in addition to that required for other matter management and collect that too. Are there external factors beyond the firm’s control (but capable of inclusion in budget scope?) Do we need to know how many times the securities plaintiff firm amended the complaint to understand the cost of the motion to dismiss? Are there internal factors that drive cost that can be controlled by the firm? Develop your firm’s code sets that timekeepers use to bucket time into major areas of effort (unless you decide to stick with the ABA’s code set). These are commonly known as “phase-task codes.” This work leverages KM professionals’ taxonomy skills and their experience with fighting lawyers’ ingrained tendency to create many small useless buckets. Aid communication, training, and awareness efforts of budgeting/pricing teams. Assist with selection and development around budgeting software. Assist with quantitative display of visual information (leveraging portal / internet skills). I hope that breaking down and highlighting some of the opportunities for legal KM to add value will encourage those of you who have remained on the sidelines to date. I hope many of you made it to the ILTA’s recent “AC2DC” conference in Washington, D.C. and were able to attend some of the KM track sessions. For anyone who wasn’t able to make it, or who was there and wants to revisit some of the sessions, ILTA has posted audio recordings from the sessions along with downloadable presentations and handouts. The KM recordings and materials are listed below (unfortunately we cannot provide direct links); please note that they are for ILTA members and that you’ll need to log into ILTA’s website to access them. Special thanks to Patrick DiDomenico, the conference liaison on the ILTA KM peer group steering committee, who was a key player in making these sessions happen. Beyond Extranets! What Clients Really Want. Meredith Williams of Baker Donelson and Scott Rechtschaffen of Littler Mendelson presented their innovative client-facing KM resources, and Lynn Simpson of DuPont discussed what her company’s legal department would like to see in law firm KM. The panel also provided a handout titled “Some Ideas On What Clients Want From KM At Law Firms”. Social Networking in the Enterprise. David Hobbie of Goodwin Procter explained how to prepare a business case for social networking in the enterprise. 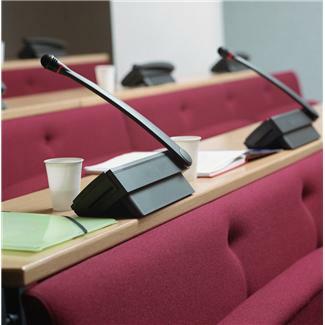 Ann Hemming of Thomas Eggar described her firm’s use of Yammer, and Scott Reid of the U.S. Judge Advocate General’s Corps presented the MilBook and JagConnect resources. The JAG Corps later won ILTA’s Law Department of the Year award in part based on Col. Reid’s work in this area. David also posted his slides on “Building a Business Case for Enterprise Social Networks”. 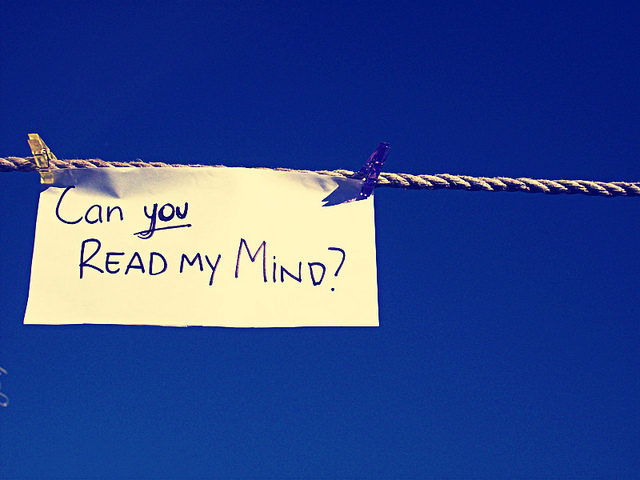 Using Your DMS for Knowledge Management. April Brousseau of Stikeman Elliott, consultant Rick Krzyminski, Chris Boyd of Wilson Sonsini Goodrich & Rosati, and Eric Hunter of Bradford & Barthel explained how their firms used document management systems to support KM resources. The panel also provided a handout with a matrix on ways to use a DMS for KM. New Benefits and Unexpected Pitfalls of Enterprise Search. Phil Bryce of White & Case, John Gillies of Cassels Brock, and Sarah Stephens of Sutherland Asbill & Brennan presented their firms’ enterprise search implementations, along with lessons learned and next steps. The slides from White & Case, Cassells Brock, and Sutherland Asbill & Brennan provide good visuals to accompany the recording. Data Warehouses, Dashboards and Data Integration: Delivering Actionable Business Intelligence. Gina Lynch and Tracy Elmblad of Bingham McCutchen and Steve Lewis of Fried Frank demonstrated their firm’s intranets, focusing particularly on the dashboard-like features in them. Gina, Tracy and Steve also described the design and rollout processes they used to revamp their intranets. AFAs + LPM + BPI = Opportunities for KM. Michael Williams of eSentio, Rob Lipstein of Crowell & Moring, and Andrew Baker of Seyfarth Shaw discussed clients’ increasing interest in alternative fee arrangements (AFAs) and how firms are using KM to support legal project management (LPM) and business process improvement (BPI) to deliver effectively and efficiently on AFA matters. Many other sessions, of course, addressed enterprise search, social networking, and other KM topics; the well-received sessions listed here were those organized by the KM peer group. We’ve already started to plan for next year’s conference, so if there are specific KM topics you’d like to see addressed, please contact me or one of the other members of the KM peer group steering committee. We’d love to hear from you! Win a full pass at Ark Group’s 8th Annual Knowledge Management in the Legal Profession conference – Courtesy of Ark Group and ILTA’s KM Steering Committee. As the legal profession bends and begins to adapt to the needs of a new economy, many law firms find themselves in transition—recalibrating for innovation in an effort to ensure that the firm is not merely a survivor, but a leader. More than ever before, clients are focused on how legal work is going to be done. Law firms need the tools and processes that drive true efficiency in service delivery and this is not a one-dimensional problem as it includes pricing, planning, matter management and reporting—as well as execution of the work itself. For KM to remain a vital function for firms (as it should) it will need to be focused on solving the core challenges facing firms today—versus the litany of needs described by the past. Ark Group’s 8th annual Knowledge Management in the Legal Profession conference will challenge the entrenched orthodoxies—dissecting the standard practices and processes that law firms assume they must do (because this is the way they have always done it)—confronted by rationalized business processes (i.e. the ones that every other industry has adopted). The challenge ahead of us isn’t as much about making the case for KM leadership as it is about finding the right skills to pioneer new initiatives. Some KM practitioners may have these skill sets—and some may not. Regardless, law firm leaders must start rethinking the “just in case” model of precedent and research collection—and find ways to marshal their resources to provide the necessary infrastructure to make course corrections, change business processes, and improve decision-making frameworks enabling law firms to deliver unparalleled breakthroughs in agility and efficiency. This year’s conference (taking place this October 24-25 in NY) is premised on a business background of increased client attention on how legal work gets done. Speakers include keynoter Toby Brown (of Three Geeks) on The Economics of Law and the Future of KM, ILTA KM Steering Committee members Scott Rechtschaffen, Patrick DiDomenico, Chris Boyd, Andrew Baker, and the author, along with KM luminaries such as Risa Schwartz, Jeff Rovner, Oz Benamram, Tom Baldwin, and Mary Abraham. To enter a raffle for a free pass, simply submit your name to kklein@ark-group.com – Make sure to put “ILTA’s KM Blog/Conference Pass” in the subject line. The winner will be chosen at random on Friday Oct 5th and their name will be posted here.